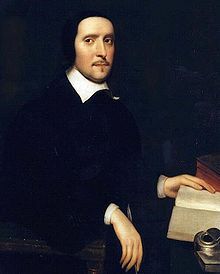 Jeremy Taylor, one of the most influential of the “Caroline Divines,” was educated at Cambridge and, through the influence of William Laud, became a Fellow of All Souls at Oxford. He was still quite young when he became chaplain to Charles I and, later, during the Civil War, a chaplain in the Royalist army. The successes of Cromwell’s forces brought about Taylor’s imprisonment and, after Cromwell’s victory, Taylor spent several years in forced retirement as chaplain to the family of Lord Carberry in Wales. It was during this time that his most influential works were written, especially Holy Living and Holy Dying (1651). Among his other works, Liberty of Prophesying proved to be a seminal work in encouraging the development of religious toleration in the seventeenth century. The principles set forth in that book rank with those of Milton’s Areopagitica in its plea for freedom of thought. Despite Taylor’s unquestioned literary genius, he was, unfortunately, not asked to have a part in the Prayer Book revision of 1662. The first American Prayer Book, however, incorporated one of his prayers, part of which has been adapted to serve as the Collect of his commemoration; and another has been added in the present Prayer Book. Taylor’s theology has sometimes been criticized, most bitingly by Samuel Taylor Coleridge, who claims that Taylor seems to “present our own holy life as the grounds of our religious hope, rather than as the fruit of that hope, whose ground is the mercies of Christ.” No such complaint, however, was ever made about his prayers, which exemplify the best of Caroline divinity, blended with great literary genius. In later life, Taylor and his family moved to the northeastern part of Ireland where, after the restoration of the monarchy, he became Bishop of Down and Connor. To this was later added the small adjacent diocese of Dromore. As Bishop, he labored tirelessly to rebuild churches, restore the use of the Prayer Book, and overcome continuing Puritan opposition. As Vice-chancellor of Trinity College, Dublin, he took a leading part in reviving the intellectual life of the Church of Ireland. He remained to the end a man of prayer and a pastor. I’d like to see the bio say something about his commitment to the unity of the church, which was as important to him as freedom of worship and belief. He believed that the Apostles’ Creed was all that it was necessary for Christians to agree on, and that if there was agreement on that we could allow each other to differ about the rest without calling our communion with each other into question. It’s a major theme in The Liberty of Prophesying. I always find myself agreeing with Michael, but I can’t about the OT reading today. I don’t feel grateful that the rest of the final sentence couldn’t dare be included (and I do agree it shouldn’t be). I see it as another formulaic and not very telling return to the cookie jar for conventional truisms. Get Bruggemann to suggest OT readings! For my part, I find most (not all) of the selections from the wisdom writings disappointingly “easy outs” that, for the most part, miss the depths of both the commemoration and the Old Testament’s witness to God’s solidarity with his creation and its people. In terms of prayer, the fact that Taylor navigated the revolution — with head intact — struck me as both tremendously important and profoundly moving. On that score, for me, the Collect was excellent. I presided at the Eucharist using the new p;ropers for Jeremy Taylor. They are quite good. No mention of Taylor’s significant liturgical work is mentioned in the biography. Particulary important is the collection of Services which he published for use in the D of E under Cromwell, when using the Prayer Book was punishable by imprisonment.